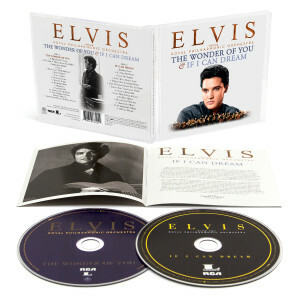 The Wonder Of You: Elvis Presley With The Royal Philharmonic Orchestra presents the iconic artist’s unmistakable voice and most dramatic original performances augmented with lush new orchestral accompaniment. Recorded at Abbey Road Studios in London with acclaimed producers Don Reedman and Nick Patrick, the album spans a variety of musical styles that Elvis embraced, from rock and gospel to country and ballads. Featuring beloved Presley classics along with several surprises, standout tracks include a sultry new version of “A Big Hunk O’ Love,” the glorious “Amazing Grace,” the heartfelt emotion of “Kentucky Rain” and a stunning new take on the classic “Always On My Mind.” The new album is the follow-up to the global phenomenon If I Can Dream: Elvis Presley With The Royal Philharmonic Orchestra, released in 2015. The 2-CD version of The Wonder Of You/If I Can Dream features both albums in 1 jewel case and a 12 page booklet. Anything by Elvis is absolutely wonderful. There will never be another performer like him. There will only be one king. You can't top his music and what he does with a song. I wish I could have seen him in person, but having his music live on is the next best thing. Thank you so much for keeping his music out there and doing new things with it. 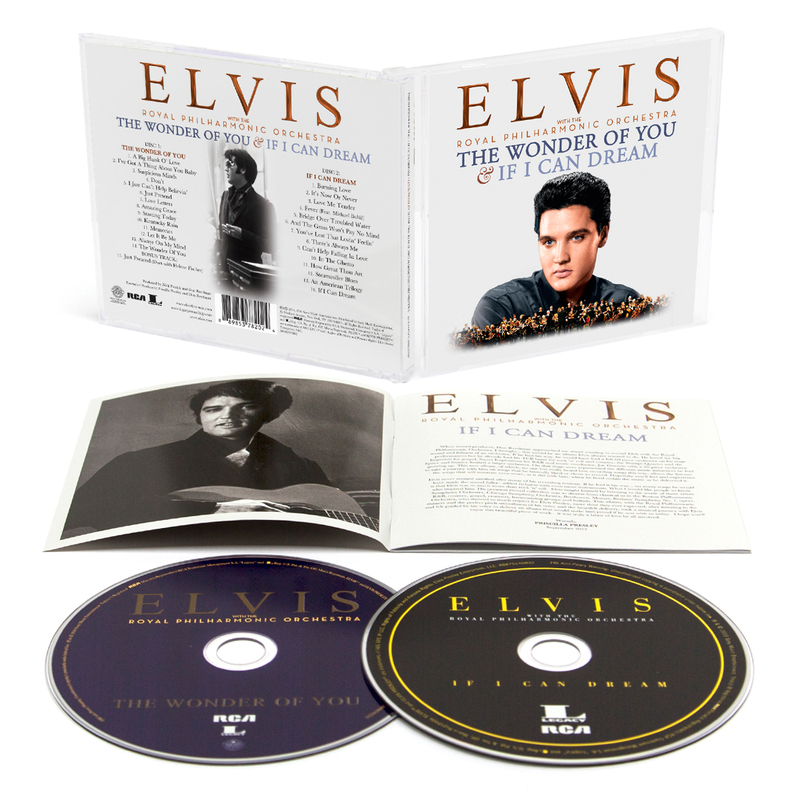 what a great follow up to the first CD " If I Can Dream" the day I received "The Wonder Of You" I listened to it three times, The Royal Philharmonic Orchestra teamed up with Elvis' unique and one of a kind voice is pure magic!! This is AMAZING!!! Played the 2-CD set with intent to work, but I got so into the music my projects didn't get done. I spent the entire time listening to Elvis and not working. Great job! Music is fantastic. IF I CAN SDREAM revealed some of the possibilities that could be done with Elvis' voice and music. THE WONDER OF YOU had appeared to me to be even superior. The choice of songs covered many eras from the almost 25 years Elvis recorded. Everytime it was with the upmost enhancement of each song. A BIG HUNK O, LOVE was brillantly revisited. DON'T version left you with much emotion. STARTING TODAY just got a new life and the adding of Mrs Helene Fisher on JUST PRETEND had proven the Colonel was wrong in not letting Elvis record some duets. Now the question is: When Volume three will be out? It will also be a must. Once again, Elvis' music scores big time. I particularly enjoyed the version of my all time favorite song, Can't Help Falling in love. My one criticism was that the orchestra "wasn't as strong" as it was on the first album. Despite that I am glad to have added this CD to my extensive collection of the music of the incomparable Elvis Presley! GREAT....Elvis never sounded better. This is among the many Elvis albums that I have. Going to purchase three more of The Wonder Of You & If I Can Dream for our daughter-in-laws and granddaughter. I even have one of his Sun Records.